Samford focuses on transformational learning that emphasizes the whole person and helps students grow physically, mentally and spiritually. Q: Why is Samford emphasizing “transformational learning” at this point in its history? A: Transformational learning is based on an underlying educational philosophy at Samford that emphasizes the whole person. Many universities emphasize only instrumental or careerist values in education; Samford has, since its inception, been concerned with "a life well lived." Learning helps students grow physically, mentally, and spiritually, and it encourages them to value public service as well as personal gain. Q: How did Samford decide on these four transformative learning abilities? A: From a long list of educational competencies, the university found a strong consensus on these four abilities: information literacy, oral communication, quantitative literacy, and written communication. Since identifying these areas of emphasis, we have had faculty committees develop operational definitions and best practices in various disciplines. We have also integrated these TLAs into our assessment process. Q: What is the connection between transformational learning and the four core literacies that are being promoted? A: The core literacies are not merely menial skills, but transformational abilities that contribute to personal growth and civic engagement. Students with strong communication skills, for instance, are empowered to make a difference in their own lives and in their communities. Q: Isn’t all education transformational? A: Certainly all educational experiences should bring about change in our lives. Focusing on the four core literacies will help us be more intentional about these abilities that transcend individual majors and programs. No matter what program of study students pursue at a university, they should graduate as better speakers and writers with an ability to find and evaluate information and to understand the use of numerical data for description and analysis. Such abilities help define what it means to be an educated person. The PBL Center evolved into the Center for Teaching, Learning and Scholarship (CTLS) in 2003. Although the Center's focus has broadened, efforts to enhance student learning through the training, implementation and documentation of PBL and other methods of active, student-centered, collaborative, inquiry-based learning; and to share these practices with other educators continues. The goal of the associated web pages is to provide administrators, faculty, students, and parents with detailed information on the components, implementation, assessment and documentation of PBL. Websites are specifically separated into PBL's background, process, evaluation, and resources. These pages also contain a guide to relevant workshops and conferences, materials, and links to other institutions that are using PBL in their undergraduate and/or graduate programs. Service-Learning is a course-based community service that links directly to academic assignments. Credit is not typically awarded for service hours but rather for assignments (essays, journals, projects, presentations, portfolios, etc.) tied to the service. Service-learning is considered a contextual learning method in which students participate in an organized service activity that meets identified community needs while providing information or experience which helps students meet course objectives. Samford University has articulated six broad goals for our students, including a commitment to "intercultural and international understanding." The Howard College of Arts and Sciences (HCAS) supports this goal through offering academic programs and international experiences that prepare our students to live in a global community. In the 21st century we will live in increasingly close contact with each other as we engage in the social, political, and economic affairs of daily life. Whether one meets face-to-face with someone from another country or faces the shock waves from decisions made in Tehran or PyongYang, we are all aware of the way our lives are influenced by people and events in faraway places. For this reason, we place a strong emphasis on the development of our students' understanding of the way our culture shapes our beliefs and values. Students completing a degree in one of the many majors offered through HCAS will have an opportunity to develop their understanding of other cultures beginning with required courses in Cultural Perspectives in the freshman year. Students will extend their understanding of culture through general education requirements that include many global and cultural elements. All students in HCAS complete a language requirement that emphasizes both language acquisition and cultural understanding. Samford actively looks for ways to show stewardship of the environment and to educate students to become aware of environmental issues. 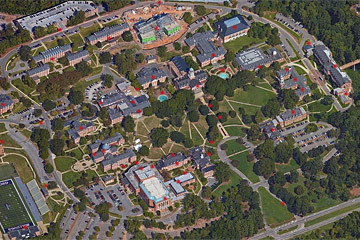 Samford's Go Green effort is led by the Office of Operations and Planning. Students can choose to major in Environmental Science, housed in the Department of Biological and Environmental Sciences. The curriculum can be found on the Department of Biology web site. In addition, students can earn a Masters Degree in Environmental Management. The courses are offered in the evenings. Students from across campus can become involved in Samford's environmental stewardship. Each spring, Samford hosts an Earth Day celebration with an art contest, student-produced posters from a variety of majors, guest speakers, films, and booths sponsored by local environmental organizations and businesses.